The recent police minister’s conference failure to agree to reclassify our lever-action shotguns (to B and D) came down to one man. There is no doubt Katter’s presence in Queensland parliament was important because it acted as a block to the ability of Queensland to reclassify the lever actions. Yet Queensland was ready to roll over, as the other states put their cards on the table. The star of the moment though, was NSW Police Minister, National Party MP Troy Grant, who refused to play ball. Instead he stood his ground, on behalf of shooters, and stopped agreement being reached. Had he not done that, we would now have another gun-grab – but we aren’t. At least not for now. Minister Grant’s decision is significant for a couple of reasons. Firstly, an agreement to reclassify the lever-action shotguns on the basis of a couple of poorly conceived videos would have paved the way for lever-action rifles to follow a similar fate. It would have also set the template for any firearm which could be erroneously described as a ‘rapid fire game changer’. It would have meant nothing – not even our 10 shot bolt-actions could be safe. If it shoots fast, it would have been put in danger. 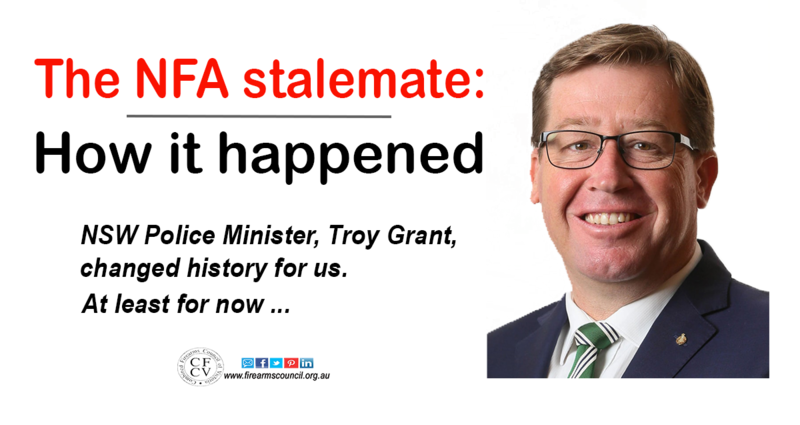 The second reason the decision is significant is that Minister Grant put his political career on the line for us – for a second time. Before the federal election, Minister Grant shirt fronted the feds alongside then parliamentary colleague, Nigel Scullion. Justice Minister Keenan then announced the NFA would not be changed – but that was before the federal election. Minister Grant was also pivotal in the NSW Government’s reversal of it’s decision to ban greyhound racing. While you could criticise him for being part of the government which allowed the greyhound ban get up in the first place, the fact is Grant showed what sort of conviction he has when he gets going. He is the sort of politician shooters need in the Coalition if we are to be assured about what we do. The Coalition also needs to understand why having people like Minister Grant among their ranks is a good thing to have. The shooting community is big. There are over 800,000 of us, who are also quite passionate about what we do, and prepared to vote accordingly. It took many, many years for the Nationals to get over the pasting they got from shooters after being sold out by Tim Fisher in 96. However the Nats have done a lot of good things for shooters in the past few years (including supporting key programs in Victoria), which has benefited the Liberals enormously. The Libs will have seen how the pro-shooting vote can make and break careers at state and federal election – and how they have benefited from the support the Nats have worked hard for. It is important that the Liberals understand the value of supporting their National colleagues, even if their personal views on firearms are different. It’s politics.